Here is the top of my piano. The Stars on a stick I made by cutting out stars using my cricut and then using glue dots to adhere the dowels. I cut two strips each from a flag bandana to tie around the dowels. 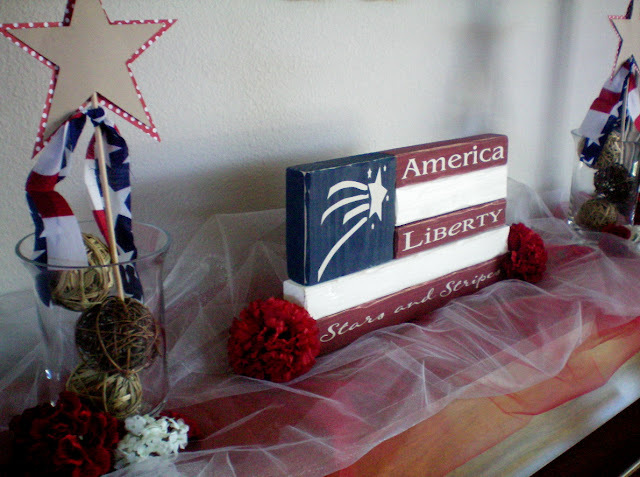 The Flag blocks you see I bought pre-cut and painted them and added the vinyl. I made those last year I believe, or the year before. Here is my Hutch. 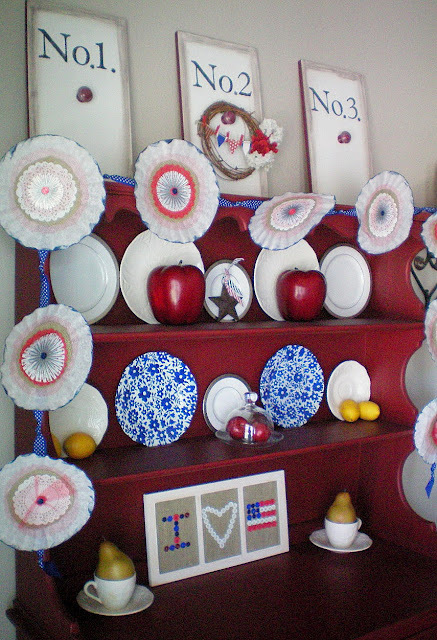 The Patriotic Coffee Filter Garland you can get a tutorial on the side of my blog. I made it last year. 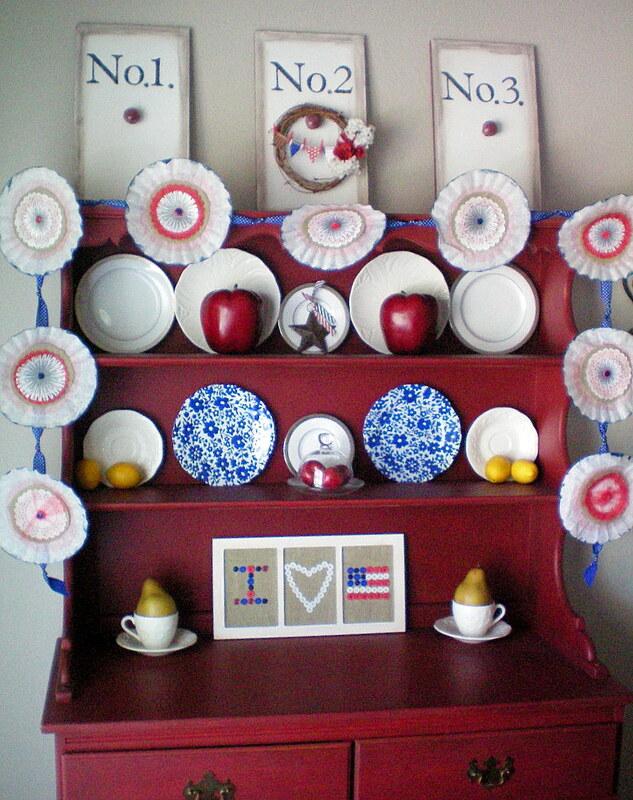 I also hung my mini pennant wreath in the center of the No.2 Picture knob Plaque. 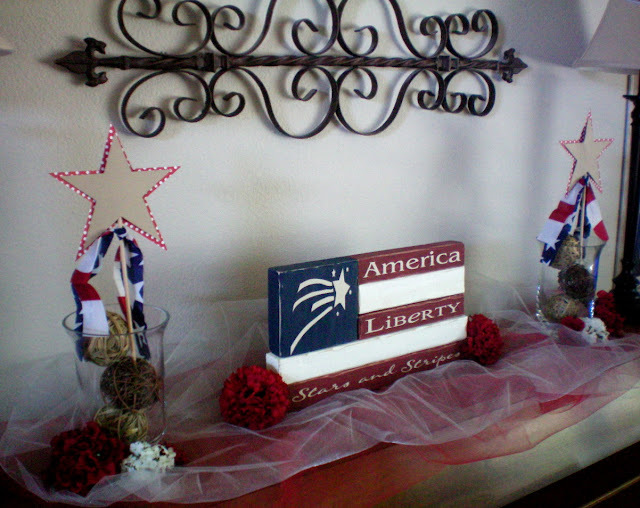 I also made the burlap and button frame last year as well. 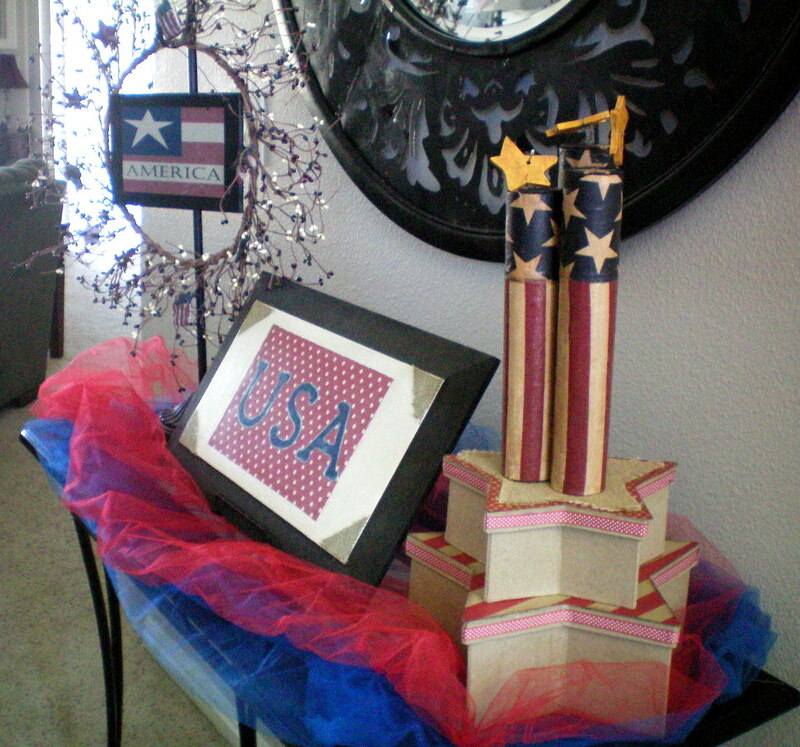 I put the star boxes I just made a few days ago, on the table underneath my firecrackers. The Firecrackers I did not make, I bought them two years ago. What I made on the table is the star boxes and the USA Plaque. I love it all!!! So festive. I especially love the coffee filter garland. Every last detail is great! I love it all! I really need to get on the ball and start decorating! I only have one thing done- a wreath! LOL! Thanks for the inspiration! I love it! 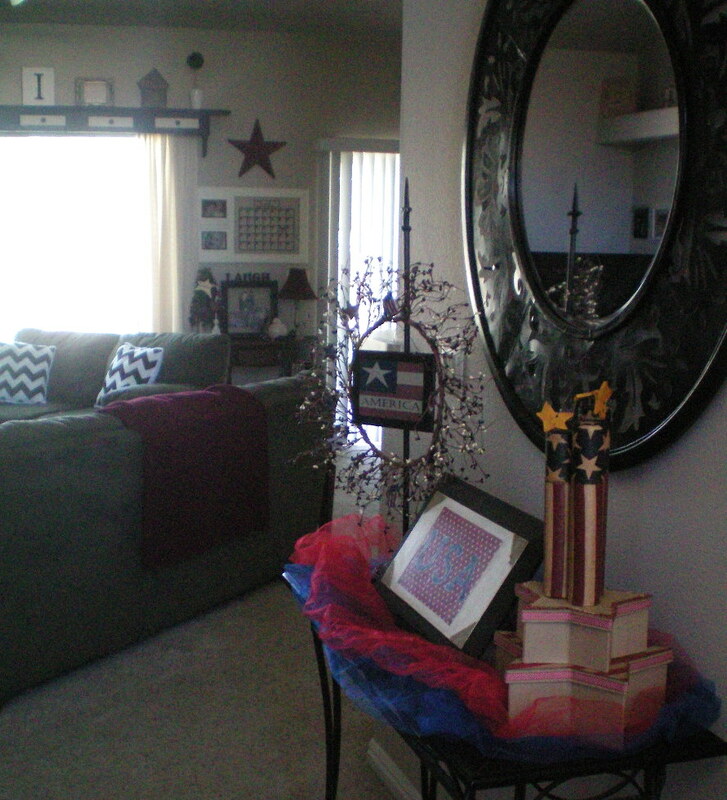 I feel so behind, I guess I need to take down my easter decorations and get caught up. LOL… ok maybe not that bad. Looks great Jen. You always do such a great job decorating for the holidays. I am just starting on mine. I agree with the others…your place looks fantastic! Pretty much love everything you’ve done! Have a great summer! 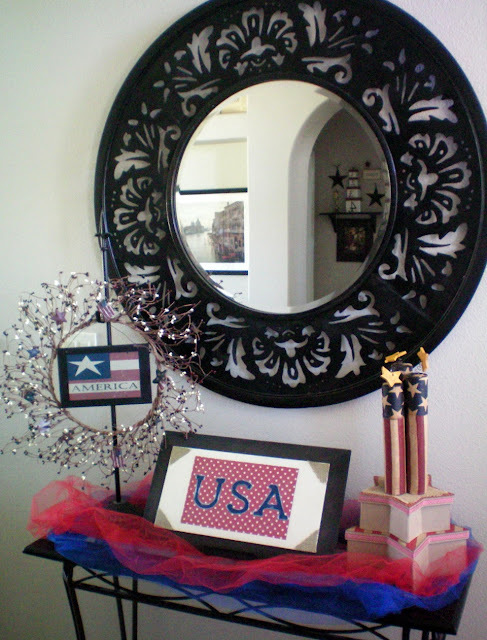 Great 4th of July decor and I love seeing your chevron pillows in the background. Made me smile!! Hope you are doing well.